My friend and former boss Ailsa McWhinnie, Founding Editor Emeritus of the English Black & White Photography magazine, recently found herself in that unfortunately familiar condition, the dreaded shooting slump. So she headed to France's Belgian frontier for the "Hell of the North"—the classic Paris-Roubaix bicycling race—with her Mamiya, meaning to face up to her reticence about shooting strangers. Filmwasters.com included the story of her day in a recent video podcast (Ailsa's star turn starts at 1:20 and goes until 7:55 or so). If you've ever been in such a slump yourself, you might sympathize. Both black-and-white photos above by Ailsa McWhinnie. ...And speaking of friends and former bosses, Ed Buziak, the Founding Editor of the U.K.'s Darkroom User magazine (renamed Camera & Darkroom prior to its unfortunate demise) is selling off some treasures from his print collection. Ed's wife Trish, always a fine free spirit, has long been an invalid, and can now move only her hands, arms, and mouth. Ed has cared for her selflessly for many years—I have honestly never heard even the shadow of a complaint from the man—but they get not a penny of help from anywhere, and Ed needs to raise some funds for Trish's continued care. He's currently got 25 or 26 prints listed and there will be 15 or 18 more posted in the next 24 hours, including a lovely Ted Orland portrait of photographer Sally Mann and some pictures by the photo writer Tony McLean, as well as some of Ed's own. All the prints are very reasonably, even cheaply, priced. Bought one myself, this morning (Ted Orland's "Even Ansel Adams has to Earn a Living"). Ed and Trish are an ever-optimistic, high-spirited, loving older couple who live their life together to the fullest. Let's see if we can help sell out this lot, in support of a better holiday for both of them! Here's that link again. Pass it along. P.S. Yours truly wrote many articles for both Ailsa and Ed, once upon a time. UPDATE from Ed: "Mike—just briefly to say 'a very big thanks' to you and everyone who has visited my site and bought prints (15 so far). Also, remarkably, visitors have also been reading my many pages of photo techniques, darkroom dodges and nature notes...with over 15,000 page impressions recorded in the past 15 hours! That's certainly up from my normal 650 or so impressions in a normal 24-hour period. So thanks to everyone again...and I hoped you also enjoyed what I have written. P.S. My wife Trish was awake most of the night—I kept saying quietly to her, 'Another print has been purchased' and she was so excited she finally said before snoozing, 'Will you put the Christmas tree up in the morning.' All the best to you, Ed. Please help support TOP by using our links to B&H Photo and Amazon! Many thanks. My curiosity piqued by articles on The Online Photographer, I recently attended a two-day workshop on platinum printing at the George Eastman House in Rochester, New York. And though I certainly learned a lot about platinum printing and acquired a great enthusiasm for it, the overriding impression I came away with was this: If you ever have a chance to attend any workshop at the George Eastman House, you'd be very foolish to pass it up. Two eight-hour days in a facility with top-flight experts doing the teaching, every imaginable (to me, anyway) kind of photochemistry available, all the necessary equipment...and access to original prints by the greatest photographers in history. How much should that cost? Probably a lot more than $425 (which included $75 for materials costs). One participant flew in from out of town for the weekend just for this event. The workshop was taught by Ron Cowie, an experienced platinum printer from Rhode Island who also teaches at the New England School of Photography. Two members of the GEH staff, Stacy VanDenburgh and Mark Osterman, assisted throughout the weekend. All phases of the workshop were held in the offices and labs just adjacent to (and below—they extend two stories below the ground floor) the International Museum of Photography at the George Eastman House. This area houses all their study and restoration labs, archives, and the museum library. The program consisted of platinum print theory, practical work, and study of original prints. Stacy and Mark had put together for each participant a three-ring binder absolutely packed with information on the history and techniques of platinum printing. We heard a good presentation on platinum printing and then saw first-hand some original prints by the masters of the technique. Emerson's "Picking the Reed" has long been one of my favorite photographs, and when we entered the viewing room there it was, alongside original prints by Coburn, Steichen and others. The library of the GEH (accessible to all by appointment) is closed on Saturdays, but the librarian came in on his day off just for us. I have no doubt they'd have been happy to get any print in their archives for us to view if we'd asked. Think of any famous photographer or, indeed, any famous photograph: Chances are they have an original print you can see. From then on we spent most of our time in the "darkroom"—in quotes because one of the nice things about platinum printing is that it doesn't require...well, darkness. We were provided with a stack of Ron Cowie's and Mark Osterman's large-format negatives (no, we didn't get to pull any famous photographers' negatives to make prints) and immediately set to work mixing chemistry, coating paper and making prints. Carl Weese's TOP article "The Making of a Platinum Print" will tell you about the basic process, but nothing comes close to the experience you gain through actually doing it yourself. The guidance of two experts with the resources of the George Eastman House at their disposal dials up the learning curve significantly, to understate the matter somewhat. At one point Ron suggested that a print might look good with a gum wash. The words had scarcely left his lips before Mark Osterman was back with the gum arabic to give it a try. A short while later the notion of asphalt wash came up. A minute later we were trying that. How about soaking the print in glycerin and brushing on ammonium citrate developer? The GEH is set up for everything from Daguerreotypes (Osterman teaches that) to cyanotypes, ambrotypes, calotypes and on and on and on. In just a few minutes Ron was brushing ammonium citrate onto a print in a bath of glycerin. Imagine taking a photo workshop of any kind with this kind of energy and these resources. It may be years before they offer another program specifically relating to platinum printing, but there are almost a dozen different topics lined up for next year. All will have the formidable resources of the George Eastman House behind them and the knowledgeable and enthusiastic support of people like Stacy VanDenburgh and Mark Osterman. In 2011, GEH will be holding workshops in Gelatin Emulsion Making, Archiving Digital Family Photographs, Daguerreotype History and Technique, Collodion Emulsion, Carbon Prints, Albumen Prints, Early Camera History and Design, and more. The schedule is on the GEH website. Taking a well-designed workshop of any kind can do great things for your own photography. When you take a workshop at the George Eastman House you're also helping support what is arguably the world's foremost institution devoted to promoting and preserving the history of photography. That the workshops are so affordably priced is icing on the cake. In fact, if there's a bigger bargain in the world of photography, I'd very much like to know what it is. Please help support TOP by using our links to B&H Photo and Amazon! Featured Comment by Geoff Wittig: "George Eastman House is an absolutely wonderful institution. It's a far friendlier and more low-key place than many leading museums, yet it houses what is arguably the greatest collection of photographs in the known universe. Membership is dirt-cheap, and permits you all sorts of benefits, from free lectures by the greatest photographers in the world to free screenings of vintage movies. There's also a yearly member's meeting with the director (Tony Bannon) where upcoming programs and exhibitions are previewed. You even get a discount on courses like this platinum printing class...which I couldn't attend because of my day job...dammit." Spotted in a recent Christmastime catalog from Pottery Barn. They're selling old film cameras as decorator accessories—"nostalgic display," as the copy puts it. at the Large Format Photography Forum. Incidentally, the picture shows an 8x10-inch Tachihara 810F (the F refers to the color scheme—mahogany with chrome metalwork and black bellows. The camera is available with this wood, these bellows, and gold metal (the GF), chrome metal with black rosewood and black bellows (the BR), or mahogany wood, gold metal parts, and red bellows (the GFR), for the truly extroverted). Oddly, the Tachihara is one of the cheapest 8x10 cameras you can buy, cheaper even than the Chinese Shen-Hao—$1,695 for the basic single-extension model, vs. $1,895 for the Shen-Hao. They're sold, special order, by Jeff Taugner at Badger Graphic Sales here in Wisconsin. And if you look carefully at the picture above, you can see a spotmeter sitting on the camera bed. When a famous photograph becomes a meme. The new Sri Lankan 1000 Rs note. This is Andrew Sanderson's video review of Mike Walker's Titan XL 8x10 (the British refer to the measurements backwards, and, actually, there's a long story behind why. But we won't get into that.) Every time I see a video review of a view camera, it makes me covet it. Mike, by the bye, is the latest in a very long and indubitably grand tradition of English camera fabricators. In fact, in some quarters classic folding field view cameras are known as "English cameras." 8x10 collodion on aluminum, Derogy portrait lens. Kerik says, "The kids thought it was 'F-ing awesome!! How'd you do that?!' "
'Net flotsam. Category: "Police fails." *From a review of the Shen Hao FCL 810-A by Andrew Bruce. "Open Mike" is a series of personal, off-topic, or light posts that appear only, but not always, on Sundays. On Saturday, November 20, 2010 the Kuwait Times published an article titled 'Multi ministry camera ban frustrates artists' in which incorrect information was provided. The newspaper regrets failing to verify the information. The article wrongly stated that a ban on DSLR cameras was implemented by the Ministries of Information, Social Affairs and Finance. This information is false. In a follow up investigation, it was proved that no such ban has been issued. We regret this error and deeply apologize for any inconvenience caused. This is another example of one of the great problems and drawbacks of the web. The Kuwait DSLR ban was widely reported as "news" across many different sites on the internet—too many to list, really (if you're curious, Google "Kuwait DSLR")—and was repeated on numerous forums, blogs and websites as if it were true. We saw something similar happen in our field recently when a team assembled by Rick Norsigian's lawyer floated a seemingly plausible press release about some allegedly long-lost "Ansel Adams" negatives that were supposedly "worth" an absurdly huge sum. There turned out to be no truth to that one, either. Yet it was so widely reported and repeated that I twice got the story told back to me by perfect strangers out in public—a guy sitting next to me at a restaurant, and a sales clerk at a retail store (the latter seemed unwilling to disbelieve the story even when I told him it wasn't true). I'm sure there are many "civilians" out there who believe it to this day, having gotten the initial story but not the follow-up. Follow-up is crucial. It's a human characteristic that the more we hear something, and from more different sources—and the better a story it is!—the more it enters our consciousness, and the more we tend to lend credence to it. (It's the foundations of advertising, and now, unfortunately, politics too.) It seems to me that in the internet age, traditional journalistic standards are going to become ever more important, not less so, and the remaining traditional news outlets are going to become more crucial to public discourse than they ever were, even as their numbers and their profitability decline. (You didn't read about the Kuwait DSLR ban story in the New York Times or the The Times of London, or hear it from the BBC [UPDATE: See Graeme's comment below].) Because it takes time, skill, training, and no small measure of good intuition to learn how to sort the true stories from fantasies and lies. Objective fact checkers will be critically needed in our world in the future, and pros are just better at it than the rest of us. But the bottom line is, we all have to be "editors" to some extent from now on—we have to continue to struggle to learn whom to trust and what to believe, and how to recognize the signs when things seem just a little fishy somehow. You've probably heard the old newsperson's credo: "If your mother says she loves you...."
Featured Comment by Graeme: "Less than an hour ago, I watched the BBC report the ban on the BBC News channel here in the U.K. on the programme 'Click.' "
Featured Comment by Hugh Crawford: "Hmm, so much for the L.A. Times." Featured Comment by Mike Plews: "My doctor has a little booklet of general information he gives all his patients. One section deals with health information on the net. He points out that there is a lot of half-baked malarkey (my words) on the net concerning health. His advice is to make sure your decisions are based on information from sources you know and trust. Good guidance overall. "I'm an assistant news director for a TV station in the Midwest. I've been in this business since 1974 and have endured my share of nonsense over the years. I remember one man who went from town to town giving paid seminars on avoiding taxes. His advice was to write "5th amendment" across your 1040, sign it and send it in. I suspect he kept IRS field auditors busy for years. I sometimes wonder if he is now dishing out similar recommendations over the net. "The internet is a wonderful thing. It provides me with The Online Photographer which is the part of my morning coffee ritual for which I am most grateful. But the net is also much like the backyard fence. Some of the people who chat you up across it are geniuses, others are imbeciles. It is your responsibility to make the differentiation and put what they say into perspective." Some of the feedback I got to my last column led me to realize that a lot of readers don't know what constitutes a good proof sheet. To put it succinctly: A good proof sheet doesn't make your photographs look good; it shows you what's in your photographs, conveying as much information as possible about the content of your negative or digital file. Now that we're into the digital age, not everybody uses proof sheets. Many photographers prefer to work with their photographs entirely on-screen. For a variety of reasons, I still find proof sheets extremely valuable. Every photographer's preference is entirely personal and idiosyncratic. If your choice is to work on-screen, that's fine with me—I'm not going to belabor my choice or debate the two approaches. If you're curious to know the way I do it, however, this column might interest you. Proof sheet photographs are a lot like RAW digital files. They tend to be flat, dull, and lower than you would like in contrast and saturation. Show an untrained viewer your proof sheets and they will be unimpressed with your photography. There will always be a few exceptions; occasionally a photograph will be so striking that it stands out no matter how it's reproduced. I have a few of those in my portfolio. But by and large the vast majority of your portfolio-quality work won't fall into that category. A photograph that looks striking in a proof sheet will likely prove to be a winner—but most of your winners won't look striking in proof sheets. Darkroom proof sheets are usually, but not always, contact prints from the original film. Hence they are often referred to as "contact sheets." I prefer to say "proof sheets" because this isn't always the case. For example, a lot of workers, myself included, learned the trick of putting three strips of 35mm film in a 4x5 film carrier and enlarging by a factor of two to print nine 35mm frames on a single 8x10 sheet of paper. It makes studying the details and visualizing the final crop a lot easier. Also, the tonal placement is closer to what you'll expect to see in a final (enlarged) print. For normally-exposed negatives, the usual procedure to making a proof sheet is to choose a paper grade substantially lower than the one you would normally print those negatives on. In color work, that simply means finding the lowest contrast paper you can that's on the market; there aren't a lot of choices. In black and white work, it means dropping at least a full paper grade below whatever is normal for you. The exposure should render middle grades approximately correctly, but blacks should not look solid black; there should be a clearly visible difference in print density between the unexposed edges of the filmstrips and the entirely clear area between strips. If your negatives are unusually dense, you won't be able to maintain that difference and there will probably be some blocking up in the shadows, but it still will be a lot less than you would get in a normal-contrast print. Here's a tip that will speed up your printing if you're making contact proof sheets. Set up your enlarger as if you were making a typical enlarged print from one of your negatives, say an 8 x 10 from 35mm film. Set the lens aperture to some plausible value for your printing. The exposure time you end up using for a decent contact sheet, combined with the way the individual frames look on the sheet, will give you a pretty good idea of what your starting exposure settings should be for making enlargements. Write the proof sheet exposure information on the margins or back of the sheet for later reference. You'll notice in the control panel that I set the effective size smaller than a full page. I did that so that it left room on an 8.5 by 11 sheet for me to punch the edge of the page for a three ring binder and room at the top for me to add title and date information about the "roll." I have a simple little action in Photoshop that takes the proof sheet, expands the margins accordingly, and lets me type information into a text layer at the top of the page. Since I work 99% in RAW format, all my photographs get massaged by Adobe Camera Raw (ACR) before Photoshop merges them into the proof sheet. The default settings for ACR are not ideal for reviewing photographs. They produce a pleasing image, but it's too contrasty and it doesn't show the full range of information in the RAW file. Kind of like the difference between looking at a camera JPEG and a camera RAW file, although not that extreme: The JPEG looks attractive, but the RAW file shows you what's there. Figure 2 shows the settings I saved as my default settings in ACR. The two important differences are that I've added 20 points of highlight restoration, which is enough to avoid excessive clipping in the highlights without significantly compressing the midtones, and I've moved the black level slider all the way down to zero. Also check the Tone Curve Point tab in ACR to make sure that the "Linear" curve is selected. That's pretty much it. Not rocket science. Not even really bottle-rocket science. Making decent proof sheets doesn't have to be a burden. I'm happy to say that although I am years, even decades, behind making enlarged prints of all of my very best photographs, my proof sheet files are 100% up to date. Ctein's regular weekly column, which was delayed for one day this week, will appear once more on Thursday (next week), and then will be switching to a new time slot—Wednesdays on TOP. I find it curious that digital photographers are preoccupied with format just like film photographers were (and are). In digital we have all sorts of delightfully unstandardized, arcane size labels—just like film, albeit even more so. Quick, what's 1/1.7" in plain English? You have no idea, do you? Don't feel bad—I don't know either, offhand (1/1.7" is 5.7 x 7.6 millimeters, a 4:3 aspect ratio). The point is, if you're a film virgin who came of age after the advent of digital, you might also not know that "6x7" and "4x5" refer to centimeters and inches, respectively, or that "127" refers to an outmoded 46mm-wide rollfilm usually but not always used in cameras as a 4cm square. The various film sizes are a permanent motley, never to be rationalized now (efforts to rationalize, which have been persistent down through the years, have almost always just led to a still greater proliferation of formats and film sizes). Minox—8x11mm image area on film 9.2 mm wide. 110—a cartridge format miniaturized from the once-popular 126 cartridge format; 13x17mm image area. APS—the short-lived format introduced by a consortium led by Kodak and Minolta to rationalize consumer snapshooting at the end of the film era. 24mm-wide film in cassettes, with three standard aspect ratios. 35mm—By far the most successful and ubiquitous film format in the history of still photography was and is movie film, 35mm wide, with totally redundant double rows of sprocket holes, one on each edge (by contrast, 110 film has one index hole per frame. A Kodak scientist once told me that if 35mm film were designed today, it would need at most two sprocket holes per frame, and only along one edge). Image area is 24x36mm. This same size has come to be known as "full frame" in the digital Universe, mainly to adapt to legacy camera and lens designs. 120 and 220—"rollfilm" refers to medium-format film, despite the fact that 35mm film comes in rolls (as in "give me two rolls of film, please") and "bulk rolls" (100-foot or longer rolls of film that come in tins and that you load into re-usable cassettes yourself). Rollfilm, first introduced in 1901 strictly for amateurs, does not come in cartridges or cassettes—it is wound around a spool with a partial or complete paper backing behind it, and when you "run it through the camera" you literally run it through the camera—it comes off the front spool and is taken up by the initially empty back spool, so it comes out of the camera wrapped around a different spool than it went into the camera on. The empty front spool is then used as the take-up spool for the next roll. There are two sizes, called 120 and 220, the latter being twice as long (many medium-format cameras can take both kinds). The different rollfilm formats are created by using various segments of the 6-centimeter-wide film—the segments being commonly 4.5cm, 6cm, 7cm, 9cm, 12cm, or 17cm long—hence 645, 6x6 (or 2 1/4, pronounced "two-and-a-quarter"), 6x7, 6x9 (Fuji made a 6x8 studio camera system once), and 6x12 or 6x17 panorama sizes. Large format (refers to individual sheets of film that can be loaded into a camera, regardless of size. A subset of large format is ultra large format, which refers to anything larger than 8x10-inch. It's abbreviated ULF, a term that started to gain currency only in recent decades). There are a few larger sizes as well, such as the famous 20x24 Polaroid cameras, but there is little standardization in mammoth cameras and they are relatively quite rare. Another major subset of format which I won't go into here are the various panoramic sizes, which range from 35mm swing-lens cameras such as the Widelux to so-called "banquet" cameras, which are ULF cameras in panoramic or semi-panoramic aspect ratios. The essence of format in film is that—as I've always said—the larger the film size, the easier it is in the darkroom and the harder it is in the field; the smaller the film size, the easier it is in the field but the harder it is in the darkroom. That's why I always shot 35mm black-and-white—I'm a very good craftsman in the darkroom but only so-so in terms of my shooting skills. Virtuoso shooters like Edward Weston and Joel Meyerowitz (who published ~100 of ~400 8x10 exposures in his great book St. Louis and the Arch (OoP and rare), which still amazes me as a "keeper" ratio) can make great work with bigger cameras. Much-more-average me, not so much. And the most interesting thing about format (in film; it has different technical connotations and hence different meanings in digital) is that there are trade-offs all along the progression from small to large, and yet the advantages and disadvantages are almost always overlapping, which makes the tradeoffs and balances endlessly fascinating. Zooms much more common, in smaller formats. Yet 35mm isn't an absolute cutoff; there exist a few medium-format zooms. Enlargements from larger formats tend to look more grainless and have more resolution. But it depends on the degree of enlargement. At 11x14", 4x5 doesn't look that much better than 6x7—at least, most non-photographers can't tell the difference. Similarly, medium format doesn't look better than 35mm in a 4- or 5-inch-wide print. But as you go bigger and bigger in enlargement size, the larger format's advantages always begin to pull ahead at some point. The larger the format, the more likely you are to need a tripod. But of course sometimes you use a tripod with 35mm cameras, and there are 4x5 cameras that are intended to be handheld (the famous Graflex Speed Graphics from the 1930s and '40s, for instance). Weegee with a Graflex (above); the cameras are still common on Ebay (below). I won't go into a complete rundown of all the issues, because when I think about it, it seems that the great majority of my readers would fall into one of two camps: those who already know all this, and those who won't care. What interests me about format at the moment are the tradeoffs in the "large format" category, which, as you recall from the above, basically means the 4x5-inch to 8x10-inch segment, and traditionally comprises three formats: 4x5, 5x7, and 8x10. The least common of the formats we're discussing, 5x7, exists on an uneasy razor's edge. It's just a bit small for contact prints, although it the size does work with many images; and it's just a little too big to enlarge, although it's still possible to find 5x7 enlargers without too much trouble. And the retrenchment mode of film photography in the onslaught of digital has made something of a casualty of 5x7. It was never popular to start with, but cameras, films, and holders have been getting even less common lately. It's still viable, however, for those who choose to use it. Four-by-five has always been by far the most popular and ubiquitous sheet film size, for reasons of economy and camera portability to some extent, but mainly because it's by far the easiest large format to enlarge. Again, there's not a clear cutoff: there do exist some 5x7 enlargers, as I say, and even a few 8x10 or 10x10 ones, although the latter tend to be enormous and prohibitively expensive. A Saltzman 8x10 enlarger being loaded on a truck. Lately, however, it seems to me that the meaning, the significance, of the larger formats has shifted considerably. 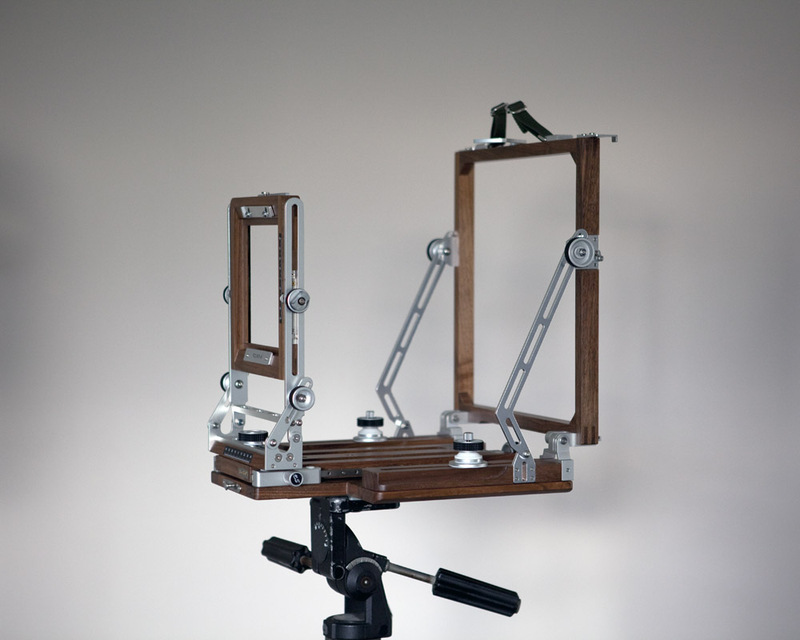 Professional photographers, especially studio and architectural pros as well as still-life and landscape fine art photographers, previously constituted a major market for 4x5. Now they have abandoned shooting the format in droves. The classifieds are awash with old studio monorail cameras, and development and sales of new models have declined precipitously. Furthermore, it seems like "convenience," always a relative term, is no longer the advantage it once was in large format. True, 4x5 is still the most common and easily the most widespread large format, same as ever. It's easiest to find equipment and film for, by far, and generally it's quite a bit more cost-efficient than still larger formats. But, as I've always said, the problem with 4x5 is that it's too small. How is that? The statement becomes less puzzling when you consider what you are going to do with the negatives. While 4x5 originally was popular because it's by far the easiest sheet film size to enlarge, you also essentially have to enlarge it—because it's too tiny to contact print. What's the problem with that? Nothing at all, except that 4x5 enlargers are expensive and require a big commitment now that you're unlikely to need one to help you make a living. In the days when you just wanted a camera with movements, the tiny-ness of 4x5 was a big advantage. Now—when digital is better in virtually every way (more flexible, more convenient, less costly, on and on)—why would you want to shoot large format at all? There's only one real reason, I think. Well, two, the second being that it's just plain great fun. But the main reason might subtly have shifted over to what my friend Oren Grad referred to the other day as "mainlining pure, unadulterated photo-optical pleasure": contact printing. I've been talking here in part to you "film virgins" out there—people who don't happen to have a past with this particular mistress. So I should digress momentarily to define a contact print. It means printing without an enlarger, by sandwiching the negative above the photo paper and shining light through it. Here's a link to a photo of Edward Weston's darkroom. (Not quite a shrine yet—notice the CDs!) Note that there is no enlarger—just a light bulb. That's what he printed with. The little rectangle under the light is a contact printing frame, the purpose of which is to keep the negative flattened against the paper. No other equipment needed, to speak of. And here's a link to a picture of photographer Eiichi Scart looking at a contact print. Note that the surround is black; that's natural. Think about it. That's why Ansel Adams trimmed and dry-mounted his 8x10 contact prints. There's no reason you "need" a contact print. They're not materially "better" than 2x enlargements from 4x5, or, for that matter, than well-made inkjet prints from good digital files. They're just beautiful, is all. And nothing imparts a more direct and visceral sense of the image cast by a lens. Certainly, in this age when the Big Print is indomitably fashionable, they won't "carry a room"—they're not great for framing, tending to get lost on most walls. They're really best for holding in your hands and looking at. I've seen thousands that way, in my marathon sessions at the Library of Congress Prints and Photographs Division. Just the picture and the viewer, an intimate, one-on-one experience. Toward this end-point, 4x5 is just below the threshold. It's not till you reach 5x7 that you really move into the range of contact-printable sizes. The trouble then is that as you move up in size from there, the problems of cameras, lenses, films, holders, and all the rest quickly mount, requiring real devotion from the photographer who wants to practice the old art. The cameras get to be whacking huge monsters right quickly, the lenses get very long in focal length (a normal lens for a 4x5 camera is 150mm, for an 8x10 300mm), the film gets expensive (a single sheet of 8x10" Kodak Portra costs $9. That's just for the film, and doesn't include developing), and the weaknesses of large format—long exposures (and hence motion blur), shallow depth of field, cost, etc.—increase exponentially with format size. Curiously, a new "sweet spot" might be beginning to emerge in the changing world of large format's new meaning. It's so far just a glimmer, highly esoteric, just a tiny subset of a tiny subset of photography at the moment. But I've finally come round to agreeing with Oren's longtime conclusion that it's curiously perfect. It's called whole plate (6.5x8.5 inches). It an unstandardized format (literally—there is no ANSI standard as there is for 4x5, 5x7, and 8x10) that sits right in between 5x7 and 8x10. It's rather radically old-fashioned—the term itself harkens back to a full-sized plate for a daguerreotype camera (whole plate daguerreotypes—the pictures, I mean—are rare, and prized). Daguerreotypy was the dominant photographic technique from roughtly 1840 to 1850. Yet it just seems like a perfect size for a contact print. To see if you agree, try this little exercise: take a common piece of bond paper—copier paper—and cut out a 6.5x8.5" rectangle. Now, just hold that in your hands, and imagine that you're looking at a picture of the highest resolution conventional photography has to offer. Just you, with a print in your hands, one on one. Nice, isn't it? only a few available new. A whole plate camera can be considerably smaller than an 8x10, and a normal lens for the format will probably be mounted in a #1 shutter rather than the much larger #3. So far, there are only a few modern whole plate or WP cameras—from Ebony, Chamonix, and Argentum, and custom builds are possible from bespoke cameramakers who offer such services, who might include Keith Canham, Richard Ritter, Gandolfi, and Lotus (you'll have to check). More than usual care must be taken in entering into this recondite little back-tributary of photography, because holders are not (!) standardized, and film is not generally available—it must be cut down from 8x10 or ordered during the once-a-year ULF special order from Ilford. It remains to be seen, of course, whether WP will grow, or if it's a passing fad. I'd love to see a true standard developed, and it would be wonderful to see new cameras. Maybe we could do a print offer some day of some nice examples of the work of present-day whole plate enthusiasts. We'll see. Of course, of the conventional formats, the best for contact printing is the way Weston worked for much of his life, the tool of choice for photographers from Richard Avedon to Nicholas Nixon to Alec Soth, and the final refuge of many purists and searchers-for-the-grail: 8x10. It has many of the advantages and few of the disadvantages of most of other large and ULF formats. P.S. For more about whole plate, you really shouldn't miss Oren's excellent article on whole plate that we published in 2007. It's good. Featured Comment by Dave Karp: "Mike, another really fun article. Regarding your friend Oren: I have corresponded with him many times via the Internet. He is supremely knowledgeable, easily shares that knowledge, is generous, reasonable, and level-headed. His online posts and his comments are always right on. I am grateful for his advice over the years. Certainly, I caught my WP addiction from him. "Regarding WP: You are Oren are absolutely right about a WP contact print. The size of the print and of the camera are both 'just right.' There are still old cameras out there. I have an Improved Seneca that was probably made early in the 20th Century (and a 5x7 back for it too). A new bellows and some cleanup were all it needed. "The lenses, in addition to being smaller and lighter, are also generally less expensive than modern lenses that cover 8x10 and larger. Most of the lenses for my 4x5 also cover the WP film size nicely. I have a bunch of old holders, but new holders are available; the lowest-priced come from Chamonix. Have a Happy Thanksgiving." Featured Comment by Bill Bresler: "And thanks for the photo of Weegee, that 'genuis' of the camera. I worked with a photographer who knew Weegee. One of our reporters actually went out on a date with him when she was going to schoool in NYC. He took her to the the Yiddish Theater. I was a young punk at the time and was pretty impressed." Featured Comment by Arne Croell: "Since your post was about all the different film sizes still (though sometimes barely) available, don't forget the European cousins of 4x5, 5x7, and 8x10, which are 9x12, 13x18, and 18x24 (measures are in centimeters). Also note that they are a tad smaller in reality, as they are for the inch sizes (! ), since the nominal sizes were for glass plates, and in old times you had to deduct the size of the film adapter for your plate holder.... Of those European sizes, 9x12 and 18x24 are smaller than their inch equivalents, whereas 13x18 is larger and thus a small step towards WP. If you look at the used market in Germany, 13x18 seemed to have been more popular than 5x7 in the USA; you can find a fair amount of cameras, holders, etc. in that size." Featured [partial] Comment by David Dyer-Bennet: "Since one of the purposes here was to provide information about film formats for people new to film, it should be pointed out (and nobody else seems to have done it yet) that the metric nomenclature for 120/220 roll film that we all use is a recent imposition, and only approximate. "That film format was designed in inches, and the formats using it are 'really' inches. 2.25 inches by 2.25 inches ('two and a quarter') is what '6x6' 'really' is. 6x7 is 2 1/4 x 2 3/4. 6x4.5 is 2 1/4 x 1 5/8). Oh, and 6x9 is 2 1/4 x 3 1/4." Featured Comment by rolo: "In all this fascinating nomenclature, you overlooked the glorious term for 120 film that is used in the instruction manual for the Nikon Coolscan 9000: Brownie film." We all have our preferences in camera styles. The country of Kuwait, however, has taken its camera preferences to heights never before seen in the history of the world! In a move sure to bolster the fortunes of the new class of mirrorless cameras in the small, oil-rich country of 2.7 million, the Ministry of Finance, the Ministry of Social Affairs, and the Ministry of Information have all banned the use of DSLRs in the entire country by anyone except accredited journalists. "We're actually not entirely sure how this happened," explained Mohammed Al-Shepwoop, the Ministry of Information's Infidel Liason, at a press conference for puzzled foreign journalists in Kuwait City. "Maybe it got a little out of hand. A bunch of us were just sitting around arguing about the Micro 4/3 standard, and somebody said he doubted EVFs would displace DSLR viewfinders entirely no matter how good they get—and then the Emir, who'd been real quiet, blurts out, 'Damn all DSLRs anyway! I wish everybody had to choose some kind of mirrorless! Micro 4/3, Sony proprietary, X1—people should take a stand and make a choice!' It kind of stopped the conversation. I mean, what do you say to that? It was probably just a moment of pique, but he's the Emir." There is no word on possible punishments for non-journalists who dare to show up in Kuwait with DSLRs, but Al-Shepwoop muttered darkly about secret prisons with 386 machines, 80MB Memory Sticks, and unsupported ex-newsroom Kodak DSLRs left over from the '90s. "I mean, it's not like every guy in the ruling elite is over the moon about mirrorless subcompacts or anything. The Minister of Finance, naturally, is a Leica guy. He could care less about DSLRs. I think his last DSLR was a 10D. "As for the Minister of Information," continued Al-Shepwoop, "We think he's just disgusted with the bigs. I spoke to him the other day and he's like, what, do Nikon and Canon think they can rub the fat bellies of their market share forever? He's got a point. We're all sick and tired of waiting for Canon and Nikon to get off their butts with their mirrorless offerings. I mean, come on, already. It's like they think tomorrow is yesterday." The Minister of Information, who speaks little English, had told journalists earlier, "We wait, we wait, we wait—no mirrorless, no mirrorless. Well, good then. No mirrorless, no more oil money for you!" Al-Shepwoop again: "But now the Minister of Social Affairs—well, he's probably behind this when you get right down to it, although I wouldn't want to get beheaded for saying so. He's been a Panasonic fanatic from the get-go. Really, the guy's the biggest Panny fanboy in the entire Middle East. And that's saying something—we get some extremists here, as you know. But if you get seated near him at State Dinners, you're just going to Allah, 'Please nobody mention photography, please nobody mention photography'—you know what I mean? Once you tick his engine over you'll be hearing about things like GH1 firmware updates and video modes til midnight." Kuwait has already also banned Cuisinarts, electric toothbrushes, the television show TMZ (quite sensibly), riding lawnmowers, belly putters, wall-to-wall carpeting—"and American so-called country music," added Al-Shepwoop bitterly. "Nothing past Bill Monroe, so help us Allah. I'd rather be buried up to my neck in sand and stoned to death than have to listen to some of the camel poop that passes for Nashville these days." Asked if film SLRs are also banned, the Minister of Information looked surprised and said, "They still make film? Really? News to me." P.S. Seriously now: I have to say I'm skeptical about these reports of a Kuwaiti DSLR ban, even though they're all over the web. They might be true, but they have somewhat of the smell of "internet wildfire" about them to me so far. I could be wrong. We'll bring you confirmation if and when a formal statement comes from the Kuwaiti government. Featured Comment by Dave: "Hmm. I can't seem to find the URL for Craigslist Kuwait." Featured Comment by Davis Littlejohn: "You really have to include Merle Haggard." Infidel Liason M. Al-Shepwoop replies: First you let in Merle Haggard, then Carl Perkins, and before you know it you're at Bobby Bare and "Drop Kick Me Jesus." It's a slippery slope. Featured Comment by Jim: "Honey, I need to buy an M9 for our next trip to Kuwait because...."
Happy 30th Birthday to the Wista field view camera, which was first offered for sale in 1980. The Wista has been available over the years in numerous iterations, and in Japanese cherry, Japanese rosewood (shown), and ebony—and lately there has been a special edition in Chinese quince, a fruitwood. (The quince tree is similar to an apple or pear tree.) Various versions have distinct features such as back shift and removable bellows. All share the strong family resemblances imbued in the camera by designer Sadamu Yasutake. The bellows have changed from leather to synthetic over the years, although I'm told leather bellows can still be special-ordered in Japan. The Wista was first popularized in the U.S. when Fred Picker of Zone VI Studios dubbed it the first "Zone VI Field Camera" (one wag on CompuServe grafted the initials "FP" on to a picture of a Nikon F4 and called it the "Zone VI 35mm camera." Zone VI, which is now owned by Calumet, did later manufacture its own cameras.) It is now distributed in the U.S. by HP Marketing Corp.
Long criticized among aficionados for its short, 12" bellows draw and less than ideal rigidity in extreme configurations, it nevertheless remains uniquely easy and hand-friendly to use with the normal-range (135mm–180mm) lenses for which it was intended (a used 150mm Sironar-N would be perfect). Yasutake-san showed great genius with ergonomics, and this is the aspect of the camera that most distinguishes it. The one caveat is that special attention must be taken to learn the trick of folding the camera up—the correct procedure eludes the uninitiated, and examples with disastrously crunched-up bellows are unfortunately extremely common on the used market. Very easy to do once you learn how, however. Rising prices in the U.S. and much more advantageously-priced newer Chinese cameras such as those from Shen-Hao and Chamonix overshadow the Wista now, and I'm told it gets very little mindshare among beginner LF shooters these days. I owned one from 1984 to 1989—had to sell it because of financial hardship—have always remembered it with extreme fondness—and it will always remain a sentimental favorite with me. Illustration: I've forgotten now where I nabbed this picture from—probably from Ebay—but if I've stepped on anybody's toes by using it here, please let me know. Having just returned from my trip to Japan, it was a pleasant surprise to see the interview posted. I noticed a few reader comments suggesting you should have asked about our full frame and mirrorless plans. I hope your readers know that until a product is officially announced, there’s really not much that I or any other employee of Pentax can say about what is or is not in the labs. I should add that we do keep a constant eye and ear on the market and provide these insights, trends and user needs to our folks in Japan. Thanks again for taking the time to interview me, and I can’t wait to hear how you like the K-5 and FA 31 combination. DxO Labs is launching a new update to DxOMark, the free resource for comprehensive data produced by DxO Lab's testing of cameras and lenses, today. The site has been updated for 2011 with several new features, new reviews and even more summaries of the most interesting conclusions that can be drawn from this data. There are also new, easy-to-digest views and scores that put the headlines front and center. 200+ new lens/camera combinations—making a total of 1,000 available on the site! Please visit www.dxomark.com to see all of information DxO Labs has made available to the public for free. As you likely know, DxOMark measurements are generated to improve the performance of products like DxO Optics Pro and rely on DxO Analyzer, the world’s leading turn-key laboratory solution for image quality evaluation. Thanks to its accuracy, completeness, and reliability, DxO Analyzer has become the reference tool for numerous leading imaging industry players. Featured Comment by Steve G, Mendocino: "Lens test results from DxOmark and other tech sites like SLRGear and Lenstip are a great resource and I'd never knock them—I've spent enough time in various labs to know how much work goes into their reports and how frustrating it is to put in those hours knowing full well the limitations and errors of the tools and methods therein. "But they're only a start in evaluating a lens. The next step is, for me, the GBC (Girlfriend, Backyard & Cat) protocol—taking the darn thing out and taking a bunch of dumb throwaway pictures under a wide variety of apertures and conditions, perhaps even using the 'on a tripod' variation of the protocol, to find out how the darn thing works for you. That, not MTF or lines per inch, is what counts. "Of course, some will insist on the WBD (Wife, Backyard & Dog) protocol. Time does not permit a discussion of the obvious technical shortcomings inherent in this approach." I've got a bit of a "picture hangover" this morning...I don't know about you, but looking at large groups of "hits" like those National Geo contest winners we featured yesterday gives me a too-much-cotton-candy-at-the-carnival feeling. Plus, I blew some shots I took. We had some extreme weather here—as I've remarked before, Wisconsin used to be north of Tornado Alley but has lately moved into it—and a cold front raced (at 65mph/104kph) across the state yesterday evening, kicking up storms as it went, including at least one tornado. I saw something I don't think I've ever seen before—I was out on the porch at dusk watching the weather, when a bright white line appeared on the southern horizon. As I watched, it moved up the sky—rather quickly. Only two minutes and forty-four seconds separate these two shots, so you can imagine how fast the air up there was moving. The contrail scudded across the sky like a wind-driven cloud. The contrail moved all the way across the sky without breaking up, disappearing to the north, over the house. At one point, an invisible jet streaked along parallel to it, laying down another crisp contrail as it went. Back inside, I switched on the news and heard something I thought was funny. The Fox News weatherman said something like this (I'm paraphrasing): "If you're in Walworth [where the tornado was sighted] and you get any pictures, you can send them to us at pix@willtakem.com. Not that we're telling you to go outside and take pictures for us. In fact, the opposite. We'd rather you stay someplace safe. Indoors. Preferably in your basement. But if you do take any pictures, you can email them to us...."
From your computer in the basement. Heh. Featured Comment by Tim F: "You saw a donuts-on-a-rope contrail. Most people think that it is caused by pulse detonation wave engines, which are supposed to power whatever the Air Force has to replace the SR-71. Nobody really knows for sure, except that those contrails often come with a buzzing sound and always seem to follow something going really fast." Featured Comment by Dave: "The donuts on a rope effect is actually caused by wing tip vortices. I have a close up aerial view of this effect on my blog here." Tour-de-force: And, lastly, another treat from boston.com's Big Picture site—47 pictures from National Geographic's Photography Contest 2010. Something for everyone. *Leland Stanford, the "robber baron" Governor of California and founder of Stanford University, once made a $25,000 bet that a horse's hooves all leave the ground at once when it's galloping. Photographer Eadweard Muybridge, who he hired to prove him right, did so. Stanford then supported further work from Muybridge in the same vein. Take a look at the wonderful animated GIF at Wikipedia made from Muybridge's 1887 still photos. Unfortunately, the story had an unhappy ending; the businessman screwed the artist in the end. Sigh. ADDENDUM: I found this outstanding article about Eadweard Muybridge by Mitchell Leslie at Stanford Magazine. Nicely done, and a good read. Muybridge really was a character. Featured Comment by James Bullard a.k.a. "Saunterer": "Yes, the 'trail names' are a long-distance hiker tradition." Joao Silva, photographer, of the famous Bang Bang Club, born in Portugal, based in South Africa, currently with The New York Times, was severely wounded in Afghanistan this past October 23rd when a land mine blew off both his legs and caused numerous additional injuries, several serious. Friends have set up a support page to help Joao defray the many expenses he and his family will incur during his recovery. You can purchase a print, contribute a donation, or simply send a message of support if you'd like to help. Featured Comment by Craig Arnold: "This is terrible news. "My wife (then girlfriend) worked with him for a few months back in the late 1980s as he was just really starting to build his reputation working on a local newspaper The Alberton Record; Alberton being a town just south of Johannesburg. "I remember her coming back from some shoots with him where he went into the townships in their big silver staff car—a Colt (now Mitsubishi) Galant. They called it the silver bullet. She did much of the driving whilst he would shoot out of the window. They were certainly skirting if not outright breaking the law by going into places they were not supposed to. I remember being very worried that she was putting herself into such danger, and in fact she still has a pile of prints from some of those shoots, mostly taken by him, but a few that she took. "He encouraged her to become a photojournalist too saying that she had a very good eye. Which is absolutely true, but she really wanted follow her passion and ambition to become a film editor, which I am very proud to say she did achieve. I must say though I'm very glad she didn't attempt to follow his rising star as a photojournalist in terminal days of Apartheid. "Memory being the unreliable thing that it is, I cannot now recall whether I ever met him. I think probably not, but she used to talk about his energy and dynamism and utter fearlessness. "We have always looked out for his pictures and admired his success and brilliance. And of course his numerous well-deserved awards." There's a new magazine out in Britain called Advanced Photographer. I'd show you the cover but there's no clean image of it at the website (growl. I wish I could lecture all PR people and rap their collective knuckles with a ruler). TOP reader Roger Bradbury of Milton Keynes, England, bought the maiden issue and says he's impressed with it and will be looking forward to issue #2. Just a WTTW to those of you who save and file archives of magazines (as some of my friends do)—the first issue is usually the hardest one to find after the fact. I'm just sayin'. Featured Comment by Geoff Wittig: "While we're on the subject of collectable magazines, I would like to point to the latest issue of View Camera magazine. The entire issue consists of a wonderful portfolio of Paul Caponigro's photographs. Although it's labeled September/October, it only hit the shelves about a week ago. "It's hard to exaggerate what a gem this issue is. Most of the 59 photographs have never been published before. The page layout and the lovely typography for the introduction are by Eleanor Morris Caponigro, one of the finest book designers and typographers of the last 40 years. The reproduction quality is excellent, up to current book standards. Anyone who appreciates Paul Caponigro's work should waste no time finding a copy before it disappears from the shelves. Caponigro's work is not well represented in print, considering his artistic importance." By the way, if you happen to like the idea of cameras of different colors but you're into older cameras, don't forget cameraleather.com—they make self-adhesive replacement leather kits out of all sorts and grades of leather and lizard skin, up to and including cobra skin. Not guaranteed to improve your photographs, but fun nonetheless. They even make a Griptac kit for the Canon S90 (with one for the S95 on the way), although Griptac is basic black. Oh, and speaking of camera colors, remember how I said, about the pink K-x, "I'm secure, but not that secure"? Well, I guess Eolake is that secure, because guess who bought a pink K-x from Japan...for street photography? As he says, "Who's gonna be antagonistic towards a photographer with a pink camera?" Featured Comment by Paris: "Regarding CameraLeather's non-pink products: I re-covered my ugly Leica M2 with black Griptac and it transformed the camera. Gives purists the heeby-jeebies, but if you actually take pictures with your Leica, it's the best modification ever." Featured Comment by Zalman Stern: "Is it true Jim Marshall had a cobra snake for a neck strap and a brand new Leica made out of a rattlesnake hide?" Introduction: A couple of weeks ago I found myself composing an email to Ned Bunnell, President of Pentax Imaging USA, to ask him to clarify a rumor. I ended up including so many questions that I decided to scrap the email and just ask him if he had time for an interview. Fortunately, I caught him between trips, so we were able to get some exchanges in before Ned returned to Japan, where he is now. What follows is edited from our correspondence. Mike Johnston: Ned, welcome again to TOP. MJ: There are a lot of things I'd like to ask you about, but we might as well jump in at the deep end. The first thing is probably the most pressing thing for longtime Pentaxians. There was a rumor on the boards recently that Pentax's much-beloved Limited lenses, including what my friend Oren sometimes jokingly refers to as the "Pentax Numerology" Limiteds—the 31mm, the 77mm, and the 43mm—are being discontinued. I think that rumor has quieted a bit now, but can you shed some light on it just for the record? NB: I'm glad you’re asking for clarification on this. The rumor appears to have started during Photokina. I can tell you we have no plans to cancel production of the FA Limited (31mm, 43mm and 77mm) lenses. In fact, we view the FA Limiteds and our newer DA Limiteds as being unique in the industry. I can share with you that we saw an increase of non-Pentax shooters adding a K-7 to their camera bag precisely because these Limited lenses were the perfect match for this camera’s compact, rugged and nicely balanced body design. I’m hopeful that this trend will continue with our recently announced K-5, which carries on the same design concept as the K-7. "Of all my photographs, the ones that have most meaning for me are those I was moved to make from a certain vantage point, at a certain moment and no other, and for which I did not draw on my abilities to fabricate a picture, composition-wise or otherwise. You might say that I was taken in." Me: Editing down 'stochastic photography' is truly tedious. Not that thousands of frames are involved; for me, 'lots' means something like, oh maybe, six. Mike: SIX?!? You're saying your 'spray and pray' method means taking SIX frames of the same subject? That gave me my morning chuckle. For it's true. The way I work with the camera, making something like a half-dozen photos really is the shotgun approach. Not one I'm inclined to by nature and, in truth, one I actively avoid without good reason. As I've written in previous columns, digital photographs are not free no matter what some folks may say. Oh yes, they're cheap compared to film photographs but definitely not free. They take time and energy to edit and time and some modest amount of money (modest is not the same as insignificant) to proof and archive. I'd rather spend my time making photographs or printing photographs than doing the routine and boring albeit necessary housekeeping chore of editing photographs. Some of you might have trouble imagining or internalizing how much I try to avoid making redundant photographs. Mike's comment, coming from someone who has known me for decades, would have made that very clear, had I not known it already. I decided some concrete examples might be both edifying and amusing. Figures 1 and 2 comprise an entire afternoon's photography for me. Almost. I did a little bit of editing to get rid of the obvious losers before I made up proof sheets; originally there were 36 photographs and now there are only 29. Editing down the photographs from that day's photography took a dozen or so minutes. Nice. This is my idea of an appropriate level of photography. Well, I went a little bit, um, wild with the birds at the feeder; that's where most of the throwaways occurred. Had I been using film, I would've made fewer photographs and made them count for more. Wotdahell. Will any of these photographs turned out to be true winners? I have no idea at this point; I haven't had a chance to look at them really closely nor work with the more promising ones. Possibly not, but had I made three times as many photographs it would not increase the likelihood one bit that I had a winner in the bunch. Plus, it would not have ended up being more fun, actually less due to more tedious editing. In stark comparison, figure 3 is one of the proof sheets from my "stochastic photography" at Minneopa Falls. In a shorter span of time I probably made four times many photographs, most of which will prove redundant, and editing down that set is going to take uninspiring hours of peering and comparing. Of course, as I explained three weeks ago, there was method to that madness and it will likely result in some portfolio-worthy work. It's just not my normal way of working and never will be. One photograph, make it the right photograph, and I'm done. It's what suits me. Ctein's regular weekly column appears on TOP every Thursday morning. Featured Comment by Rana: "I think my approach is similar to yours. Partly it's a hold-over from film and early training, partly it's fear of having still. more. photos! to process, and partly it's because I'm easily swayed by the next thing." Featured Comment by Hugh Crawford: "I almost always shoot handheld and with digital I have started to shoot three frame bursts even if it's a photo of a tree. One of the three will always be sharper or better in some way than the other two. With moving water it's easy to pick the best of three, but the best of 10 is a lot of work. "With portraits it seems like for most people one in three is usable on account of blinking or something like that, and maybe half of the usable ones are good. Of course that means that for two sitters it's one in nine usable shots and one in 36 where both look good. For a group of five lawfirm partners it's one usable in 243 on average, but who wants to take chances with five lawyers so you take maybe 500. If one in six are not just usable but good it will take 7776 on average to get them all looking good or maybe 15552 just to be safe. They are lawyers after all." Featured Comment by Gary: "Well for a change of pace, I went out last Saturday afternoon with my 1967 Rolleiflex and 3 rolls of 120 Delta 400. Didn't miss a frame and have posted 25 different images on the web. Very therapeutic and a very different experience from filling up SD cards." Mike replies: Whew. I've never seen your SD cards, of course, but from the looks of those pictures, you should stick with the Rolleiflex. I've been struck when watching "Top Gear" how parochial every nation's sense of celebrity can be—I recognize only a few of the guests. I'm sure if I lived in Britain I wouldn't have escaped the knowledge that Linda Eastman McCartney's daughter is also a photographer; but I didn't know. And she's a good one, albeit quite different from her famous mum. (That's correct, isn't it? "Mum" means mom in English? I kid.) What can I say? The reach of my knowledge is nothing when pitted against the extent of my ignorance. Featured Comment by Iain: "Reminds me of Rosemarie Laing's 'Flight Research' series, circa 1999. Some examples here." Featured Comment by John Wilson: "There's a show of her work at the Michael Hoppen Gallery in London. This coincides with the release of her book From Where I Stand. (U.S. link ) Anybody tempted to pop in to see her work should also climb the second set of stairs and see Robert Bergman's stunning portraits. "Jim is right; her sister Stella is far better known in the U.K. I think the only U.K. fashion photographer with any sort of recognition by the general public here is Rankin." Thanks very much for all the comments, private and public. Very helpful indeed—I got several crucial recommendations from the responses that I wouldn't have thought of otherwise. This will enrich the final list, assuming I ever actually get it done. And, incidentally, that post set a new TOP record for number of comments—252 in 17 hours (better post this before more come in). And I read every single one, no foolin'. Thanks to all.